A home opener is full of promise. A new season. New players. The stadium is full of fans knowing this year is the year. Pre-game activities before the home opener for the Syracuse Crunch. Syracuse Crunch goalie Jeff Deslauriers (43) prepares the crease, people stand during the US National Anthem and the ROTC Color Guard presented the American flag. Many of the players were new to the Crunch. 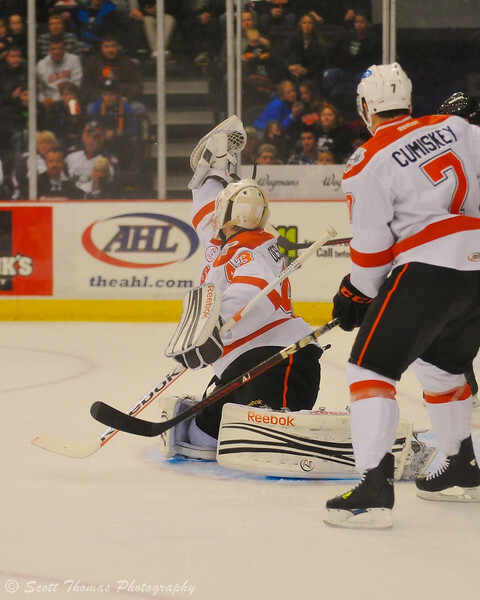 Being in the American Hockey League (AHL) means a player is one step away from being called up the Crunch’s National Hockey League (NHL) affiliate, the Anaheim Ducks. Most are young and in their first or second year of being a professional and are full of energy in hopes of making the next step in their careers. Some players have been playing in the AHL for awhile and many never get to the NHL. These veteran players help the younger ones and bring experience to the team. Syracuse Crunch goalie Jeff Deslauriers (43) snags a shot by the Adirondack Phantoms in the Onondaga County War Memorial on Saturday, October 15, 2011 in Syracuse, New York. Crunch won 6-2. Nikon D700/70-200VR, 1/2000s, f/2.8, ISO 2800, EV +1.0, 95mm focal length, cropped. Crunch goalie Jeff Deslauriers is such a player. A seven year pro, he brings skill and experience to a position the Crunch have missed the last few years. Because of where my seats were for this game, we’ll be seeing more of Jeff below. Syracuse Crunch Nicolas Deschamps (16) checks an Adirondack Phantoms player. Nikon D700/70-200VR, 1/200s, f/2.8, ISO 4000, EV +1.0, 82mm focal length, cropped. Syracuse Crunch Kyle Palmieri (21) scores his second of three goals against the Adirondack Phantoms goalie Jason Bacashihua (33). You can see the puck near the goalie's left shoulder. Nikon D700/70-200VR, 1/200s, f/2.8, ISO 5600, EV +1.0, 135 focal length, cropped. Normally I try and get seats near the goal the Crunch shoot at twice in a game. For this game I was in the end the Crunch defended twice so I got a lot of photos of the goalie. Here he is kicking out a shot in the third period and then celebrating the victory. 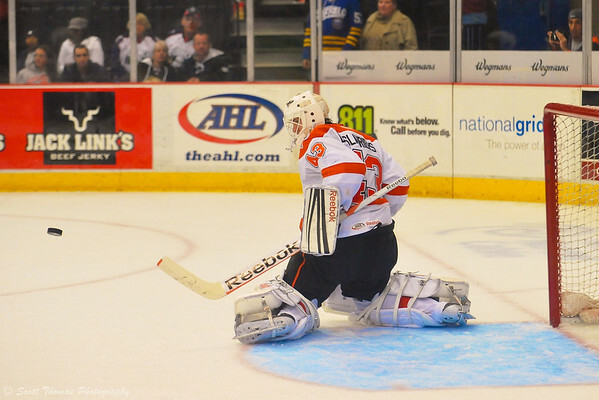 Syracuse Crunch goalie Jeff Deslauriers (43) kicks out a shot against the Adirondack Phantoms. Nikon D700/70-200VR, 1/2000s, f/2.8, ISO 4000, EV +1.3, 105mm focal length, cropped. I was impressed with the speed the Syracuse Crunch displayed on their way to a 6 to 2 win over the Adirondack Phantoms. If they can continue to play as they did it could be a good year for the Crunch and I will see more victory celebrations like this. 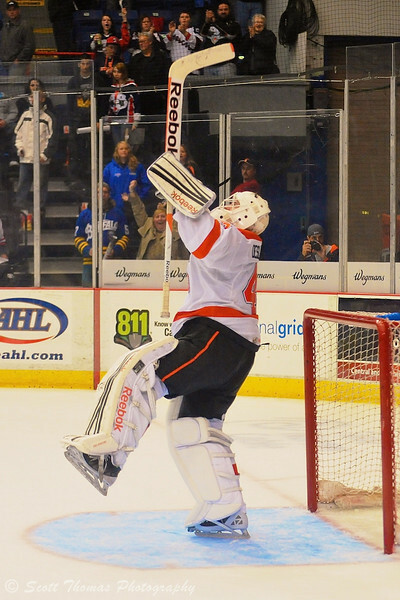 Syracuse Crunch goalie Jeff Deslauriers (43) celebrates his team's victory over the Adirondack Phantoms. Nikon D700/70-200VR, 1/2000s, f/2.8, ISO 5000, EV +1.3, 86mm focal length, cropped. 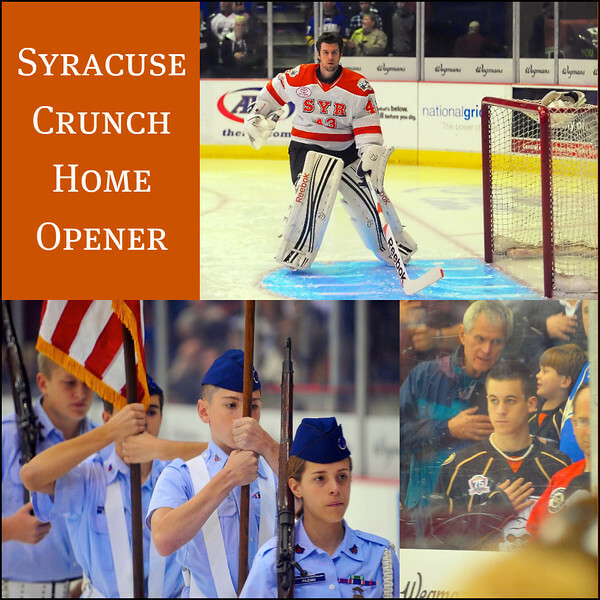 This entry was posted in Sports, Weekly View and tagged 70-200mm, adirondack, ahl, color guard, crunch, goalie, home opener, ice hockey, national anthem, new york, nikon D700, onondaga county, phantoms, players, professional, rotc, syracuse, vr, war memorial. Bookmark the permalink. I must say that I’m impressed Scott. You and your super gear really can freeze the moment and make pictures that show the games’ action. I love the two last pictures – and the others too! Thanks, Carsten! I was a little rusty and missed many shots. I’ll get better once the high school season starts and I am doing games on a regular basis. I’m very impressed with your gear, mine starts to have digital noise at ISO 3200, that’s the highest I dare to go when shooting indoor. 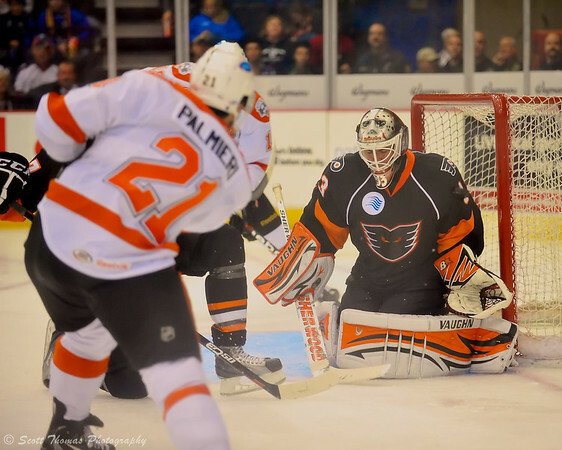 I love the 3rd from the last image, the clarity and detail of the Adirondack Phantoms goalie helmet (mask) looks awesome.